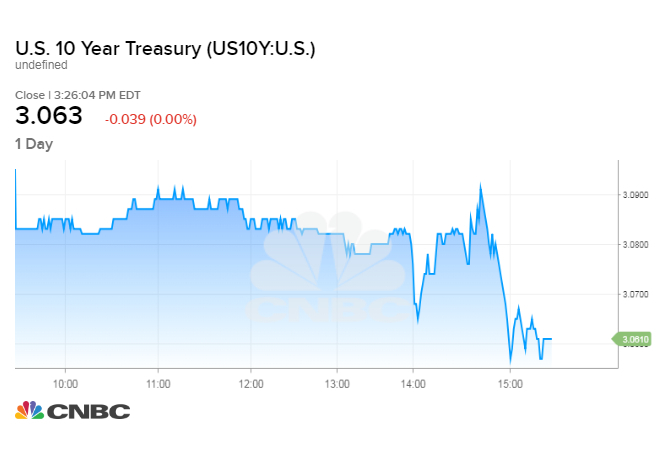 Comments from Federal Reserve Chairman Jerome Powell sent bond yields lower even after the Fed hiked interest rates. Asked what could spur the Fed to increase the federal funds rate even faster, Powell said the central bank would need to move more quickly to raise rates if inflation "surprises to the upside." "We don't see that," Powell said. "It's not in our forecasts." The yield on the 10-year Treasury moved to session lows following the comment. One of the Federal Reserve's main jobs is to keep a lid on inflation, and Powell indicated that's not a very difficult task right now. While there has been scattered evidence of price pressures, the central bank chief said there's no evidence of fundamental inflation building up in the economy. The Fed is tasked with keeping inflation around 2 percent. Powell noted that headline inflation as measured by the Fed's preferred gauge is around 2.3 percent. Projections released Wednesday from FOMC members indicated that inflation will hold around 2.1 percent for 2018, edge lower to 2 percent in 2019 then hold at 2.1 percent for two years before settling into 2 percent over the long run. Asked whether tariffs imposed by the U.S. and China on each other's goods was having an impact on inflation, Powell said there are some signs but nothing lasting so far. "We're hearing talk of labor shortages, of labor costs, what amounts to supply-side constraints, but we're not seeing it," he said.